Welcome to our World of Warcraft encounter guide for Maiden of Vigilance in Tomb of Sargeras. We will teach you everything you need to know to defeat the boss in every difficulty. The other pages of our Maiden of Vigilance guide can be accessed from the table of contents on the right. The Maiden of Vigilance is the seventh boss housed in the Tomb of Sargeras. Charged by Aegwynn to defend the Tomb of Sargeras, the Maiden of Vigilance has stood watch for hundreds of years. Yet, the guardian did not forsee what effect the avatar's seeping fel energy would have on this titan construct. Slowly warped by this maleficence, the Maiden now seeks to destroy any in her path. The fight against the Maiden of Vigilance is comprised of 2 phases. The first phase, Divide and Conquer, encompasses the main part of the encounter. The second phase, Watcher's Wrath, will serve as an intermission of sorts where the Maiden will jump away and shield herself, absorbing a fixed amount of damage and beginning a channel than deals increasing damage with each tick, finally wiping the raid unavoidably at 30 stacks. If the raid manages to break the shield in time, the channel can be interrupted and the first phase resumes. Overall this constitutes a simple but punishing encounter that requires clean mechanical play and strong numbers output. The Maiden of Vigilance will infuse each raid member with either Light Infusion or Fel Infusion. Taking damage from an ability that does not match your Infusion will trigger Unstable Soul. Avoid taking any damage from abilities of the opposite Infusion or Unstable Soul will be triggered. Jump into the pit in the center of the room if you are affected by the Unstable Soul debuff to avoid damaging the raid (due to Aegwynn's Ward). Collect Essence Fragments matching your Infusion during Phase 2 to stack a damage and healing buff to help break the Titanic Bulwark. Help the tanks soak the frontal cleave matching your Infusion. Perform a taunt swap when the Maiden switches between Hammer of Creation and Hammer of Obliteration so that the current tank has a debuff matching the current hammer ( Fel Infusion for Obliteration and Light Infusion for Creation). Ensure players of the correct debuffs are in the conal cleave from the Hammer of Creation and Hammer of Obliteration. Coordinate healing cooldowns as the damage from Wrath of the Creators increases. Be ready to perform surgical healing when Mass Instability occurs. Prepare cooldowns to quickly break Titanic Bulwark in Phase 2. 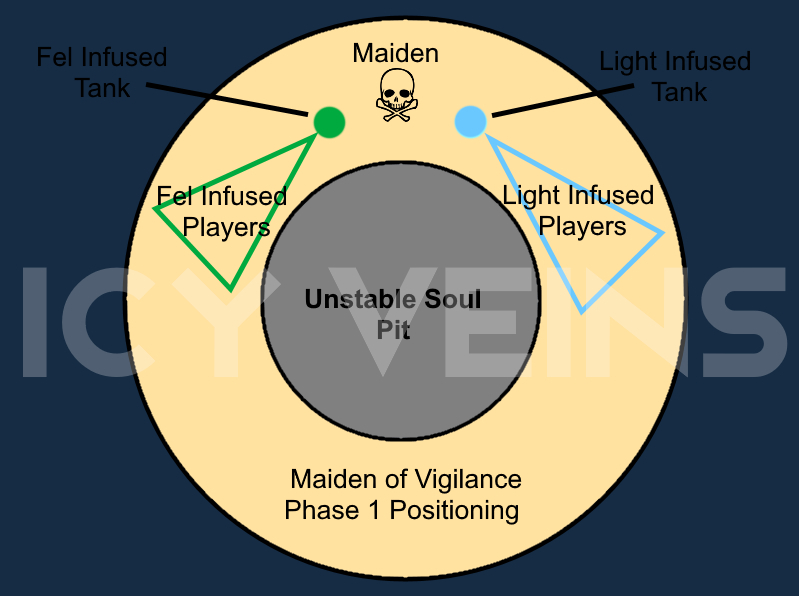 Positioning during Phase 1 is determined by the Infusion debuff. The raid should place markers on either side of the boss designating a Fel Infusion side and a Light Infusion. Once Infusion is cast, all players should form a loose spread on their designated side of the room. The tanks will trade the boss back and forth as the Maiden swaps between her hammers, allowing the raid to easily split the cleaves without necessitating movement. During Phase 2, the boss will leap away, stunning players momentarily. The Maiden will shield herself and begin a channel, increasing in intensity with each tick that will wipe that raid after it reaches 30 stacks. The raid must collect Essence Fragments to boost their damage and healing and break the shield. Once the Titanic Bulwark is broken, the channel can be interrupted and Phase 1 positioning resumes. We advise you to use Bloodlust/ Heroism/ Time Warp on the pull for maximum damage, however, it can also be used during the first Wrath of the Creators if your group is struggling to break the shield. Either usage is acceptable, although on the pull usage is favoured if safely cracking Titanic Bulwark is consistent. 06 Aug. 2017 (mythic page): Mythic page added. 14 May 2017 (this page): Guide added.